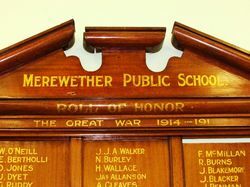 At the Merewether Public School on Friday, afternoon, the honour roll was unvelled by Mrs. A. Curry, wife of the president of the Parents and Citizens' Association connected with the school. The ceremony took place in the presence of the children and a large number of parents and visitors. Mr. A. Curry, in addresslng the assemblage, expressed his appreciation of what the school children had done in connection with the honour roll. 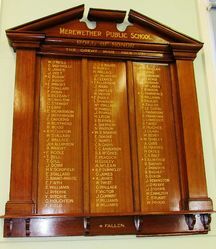 The enrolment of the names of ex-scholars on a board hung in the school was a fitting end proper thing to do. The Rev. G. Read also expressed his appreciation of the spirit that prompted the staff and pupils to honour the ex-pupils who had enlisted. Some of the brave lads who had gone, he was sorry to say, had been killed in action, and others had been wounded, and the parents who had lost their sons in the war had his sympathy. At this stage Mrs. Curry unveiled the roll of honour, and was presented by little Miss Ralph with a bouquet of choice flowers. Newcastle Morning Herald and Miners' Advocate (NSW), 24 September 1917.